KSF | S&P Canada Ventilation Products, Inc.
Supply air to over 12,000 CFM in static pressure capabilities to 2" w.g. The KSF fans are roof curb or curb cap mounted filtered supply fans rated from 375 to over 12,000 CFM, with static pressure capabilities to 2". 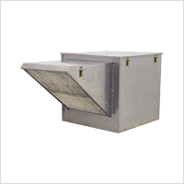 They are specifically designed for filtered make-up air in kitchen hood applications. KSF's rugged design with heavy-gauge galvanized construction provides maximum weather protection, long life and the utmost in performance efficiency. The forward curved centrifugal blower provides efficient air flow at low sound levels with static pressure capabilities to handle ducted air systems or hoods within a building. The filters are washable and are reusable to reduce maintenance costs. Quick release hood latches make routine cleaning and maintenance fast and easy. The primary use of these fans is for filtered make-up air in kitchen hood applications but may also be specified for make-up air in commercial and industrial applications such as manufacturing and assembly areas. 9 24-1/4" 24-1/2" 17-7/8" 19"
10 27-3/8" 28-1/2" 21-1/8" 22-1/2"
12 32-3/4" 32-1/2" 26-1/2" 27-7/8"
15 37-3/8" 32-1/2" 34-1/4" 30-1/8"
18 41-3/8" 36-1/2" 38-1/4" 33-3/8"
20 49-1/2" 51-1/2" 37-1/2" 38-3/4"